To celebrate the 10 year anniversary of Disney & Pixar’s Ratatouille (that’s right, it’s been 10 years!!! ), my husband, also known as @GarettMakesArt has made a lovely piece of Ratatouille chalkboard art to decorate our kitchen. The phrase “Anyone can cook” was one that truly inspired me. Just five years ago, I would never cook (unless it was a frozen meal). I never was really taught how, and so felt I wasn’t very good at it. If you were to tell me that years from now, making recipes and styling food would be my life, I wouldn’t have thought it to be true! But alas, when I set out determined to eat at home to fit a budget, and also eat all natural, I learned along the way. Not only did I learn to cook and bake, but I learned out of practice to make my own recipes, and start falling in love with cooking! I was a Linguine turned Chef Remy. Given my journey, we thought it would be great to showcase this inspirational cooking quote in our kitchen using my husband’s art talents. You can watch the step-by-step video on how he made this Ratatouille chalkboard if you wish to copy his steps to make your own at home! You can find his art which he does for freelance and hobby on his Instagram at @GarrettMakesArt. Thanks for the chance to win. Have a great day! I am having to learn a new way to cook as I am 6 months out from my stem cell transplant. 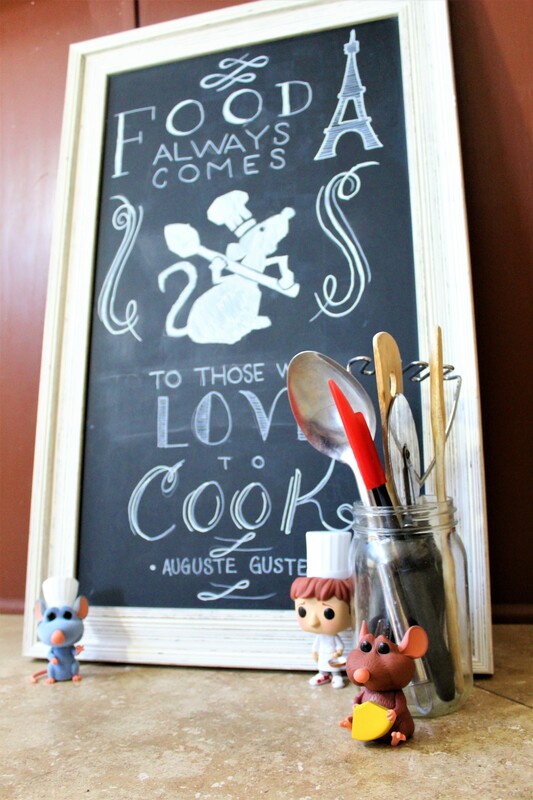 The Ratatouille Mini Chalkboard is so cute!